This is a plan from a rent book that belonged to the Mercer's Company, one of the most prominent of the City Livery Companies. The Mercers' were merchants who dealt primarily in textiles. Amassing great wealth they came to own land and property which they rented to tenants. 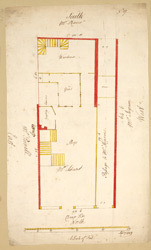 This is a plan of a shop on Cheapside, a market place since medieval times when many of the craft guilds were located a short distance from here. As noted by Chaucer in The Cook's Tale, Cheapside was infamous for rowdy apprentices who 'preferred the tavern to the shop'. This particular shop also has a compting [counting] house and a warehouse and is linked to the rear neighbour by a passage.